Shannon and I were doing an interview up at Spianata Castelletto, the "small castle". 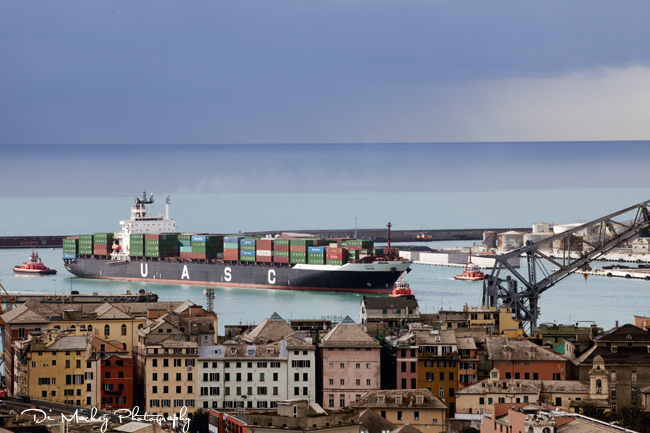 It's a name that refers to the old fort that used to overlook Genova as of the 10th century AD. Unfortunately it was dismantled in the late 19th century but the view up there is beautiful. It's a tranquil area, filled with older people taking in the sun and the view, while mothers and fathers bring their babies there. As we were talking as ship's horn blasted across the city, demanding attention it seemed and so, I have a series of photographs of this massive container ship being guided into port by the 3 tug boats.